For a while tech seemed to be getting cheaper. Bargain phones, affordable all-metal laptops and the like gave the careful buyer something to be happy about. But in the last year a lot of gadgets prices have risen, particularly in the UK. The Acer Swift 3 is a laptop for the sort of person who looks at creeping laptop prices with horror. The version we're reviewing costs £749 and is basically a much more affordable take on the MacBook Pro. But with Windows, obviously. The Swift 3 is a sound deal only diminished by the fact that the last version of the Swift 3 Acer released was both cheaper and a bit better in some respects. Here's what we make of the 2017 model. The earlier model certainly wasn't prettier, though. The new Swift 3 has a redesigned shell that is almost all aluminium. The lid, the keyboard surround and the base are metal, with just the inner part of the hinge as plastic. The most important visual upgrade here is to do with the screen. Where the older Swift 3 had a classic 'lip' around the screen, the 2017 version's display is covered by a flat sheet of Gorilla Glass, a toughened glass that's used in many phones. It gives the Acer Swift 3 the look of a high-end laptop - again, a bit like a MacBook. What the Swift 3 doesn't have, though, is the ultra-thin screen bezels of some of the latest £1000-plus laptops, like the Dell XPS 13. As such, the Swift 3 doesn't quite have the portability points of some pricier rivals. It's 338mm wide and weighs 1.8kg. That's light enough to carry around in a bag without feeling like you're carrying a weekend's worth of luggage, but next to something like the 1.1kg HP Spectre 13, it does seem a little tubby. To try to get the most impact out of all that aluminium, the Acer Swift 3 has a brushed finish on its lid and keyboard surround. We could argue that it might look even better with the plain anodised-style finish used on the bottom throughout. But it seems a minor point when it can square up to laptops that are £200-400 more expensive. 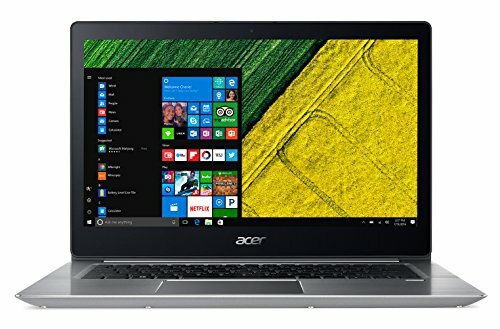 Acer has clearly made the Swift 3 to appeal to the mass market: it's smart, it's not too expensive and it has all the connections laptops like the MacBook and Asus ZenBook 3 UX390 have started leaving out. There are three USB ports, a full-size HDMI, an SD card reader and the newer USB-C port. It's everything most people will need. There's one disappointing bit to the Acer Swift 3's exterior hardware. Press down on the keyboard, particularly towards the centre, and you can get the aluminium plate to flex. A lack of a stiffness in this area is a key sign of flawed build, and it's not something we've seen in any other Acer laptops recently. The last Swift 3 was more rigid. It's a shame, but not a deal-breaker. The keyboard doesn't tend to flex when you type normally, only when you press fairly hard. Let's just hope this isn't the start of a slide from Acer's usual very solid build quality. That said, the Acer Swift 3's keyboard is a pleasure to type away on, as long as you don't mind a lighter feel rather than a meaty, high-resistance one. Coming from using our day-to-day MacBook, it feels great, but some of you may find it a little too much of a featherweight. It has a two-level backlight, though, making working at night a cinch. By the right of the keyboard, the Swift 3 has a fingerprint scanner which is used to unlock the laptop. This looks like one of the old laptop scanners you had to swipe your finger across to get working, but it's actually just a very slim and modern scanner that you only need to rest your finger on. Much like what you'll find in the Lenovo Yoga 720. Like quite a lot of these laptop scanners, it seems to take a couple of tries to work; it's not as quick to use as the pads we see in phones. As the Windows Hello smart login feature blocks the scanner after a couple of tries, you may find you need to input you PIN/password a lot of the time anyway. Below the keyboard sits a very MacBook-like, large touchpad. Its clicker feels great and there's plenty of room for multi-finger gestures. For an even better Apple impersonation you'll want to disable the dedicated right button zone. As the right button takes up half the width of the pad, it can be easy to accidentally right click. The sensitivity is a little hot too, the Swift 3's pad prone to registering clicks when you're just scrolling around a web page. Windows 10 lets you fix this behaviour too, though, by disabling light-tap clicks. A classic sign this isn't a true high-end laptop, however, is the touchpad surface's plastic finish. There's no textured glass here. This makes it a bit more 'squeaky' as your finger glide changes direction. However, it's otherwise pretty close in look and feel to a top-end glass pad. The Swift 3's screen mimics that of a more expensive laptop too, with a fully flat 14-inch 1080p IPS display. This is slightly larger than most portable laptops, which tend to have 13.3-inch panels. It's a mostly satisfying screen, but again if you go looking for compromises you'll find the odd one or two. First, colour is a bit undersaturated. Maximum brightness is also quite limited, which becomes an issue if you take the Acer Swift 3 outside. As it has a glossy finish, reflections will be an issue. It's about 30 per cent less bright than its brighter competitors. Keep the device indoors and it's bright enough, though. Oh, and despite the glassy top covering, the Swift 3 doesn't feature a touchscreen: the flat, glassy design is just for the look. However, the hinge does let the screen tilt back a full 180 degrees, and feels very solid when doing so. We're using the mid-range version of this laptop, which has a 256GB SSD, Intel Core i5-7200U processor and 8GB RAM. There are also Core i3 versions for £599 (4GB RAM) and £649 (8GB RAM), which will get you similar day-to-day performance, particularly the 8GB model. However, they also have 128GB SSDs, which will get full pretty quickly if you download a lot of content. There's a Core i7 model for £849 too, but as these are all dual-core low voltage CPU laptops, the difference in performance isn't really world-changing. All will feel quick and responsive, similar to laptops hundreds of pound more expensive. The £1,300 HP Elitebook x360 uses exactly the same chipset, for example. We'd happily use Photoshop on the Acer Swift 3, and it has enough power for light video editing and other slightly more demanding jobs. Those who have needs that really ask for a quad-core CPU and 16GB RAM probably already know it. As with any laptop that uses integrated graphics like the Acer Swift 3 and its Intel HD 620 GPU, it can handle some games, but more recent ones aren't going to run well at 1080p. Skyrim runs well at 1080p low settings on the Swift 3, but becomes choppy when the graphics are switched to the High preset, which makes the game a lot prettier. The only slim and light laptop that'll perform miles better is the Microsoft Surface Book, and that's also a lot more expensive. Gaming shows one benefit of the Swift 3's slightly larger-than-average stature too, though: it is a lot quieter than laptops that try to be thin above all else. Much of the time the Swift 3's fans are barely audible. After 20 minutes of gaming, the Swift 3 gets a little louder, but there are no mini jet engines to be heard here. One other part of the Swift 3 that isn't so 'standard' is the speaker array. As usual there are two speakers - one at each end of the underside - but top volume is unusually loud. While sound quality is a little coarse at higer volume, there's real body and projection to it. Weedy these speakers are not. Battery life isn't as strong, however. The Acer Swift 3 lasts around seven and a half hours with general use, skipping between writing, browsing and watching some content on YouTube. As many of us do when trying, and partly failing, to be productive. It's not quite the all-day battery life we look for in a portable laptop, and is a little disappointing when the Acer Swift 3 is chunkier and heavier than other models in this thin and light class. However, it's on-par with something like the HP Spectre 13, a laptop far more expensive. Spend just a little more and the great stamina of the Lenovo Yoga 720 is the way to go. While the screen could be brighter, battery life a bit longer and the keyboard surround a little stiffer, it's hard not to let these points pass given the price. Particularly when comparably priced rivals from HP and Asus are dribbling off the market, generally to be replaced by more expensive models. Ok, so it's more expensive, but with a little extra power and better battery life from this supremely well-built laptop, it's worth its £949 price tag.